I have not painted on my band painting for a few days due to preparing and teaching classes. But, that is ok because it gives me time to see it with fresh eyes when I get back to it. Below is a more recent photo of the paintings progress. I have added a warm redish-brown to the background and I have started working on the main tuba. 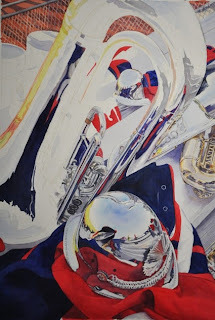 There are so many reflections in the tuba that I am working on small sections at a time. I also continue to add color and shadows to the clothing. The darker values help me judge all of my other values. Even though the foreground helmet looks done at this point, I still found some things that needed to be added when I looked again.